Geth Coffice (v1.8.8) is a tiny biweekly release, containing countless code cleanup PRs from @kielbarry#16562). Fix crash when using an invalid private network genesis (#16682#16716). Handle Android signing keys flexibly, hopefully fixing Maven (#16696#16666). Support retrieving receipt status codes from the mobile libraries (#16598Geth 1.8.8 release milestone. The Swarm Team is pleased to announce the immediate release of Swarm client v0.3, the third proof-of-concept release (POC3) of the Ethereum Swarm client. The POC3 code is now merged into the official go-ethereum repository’s master branch. Swarm 0.3 has been deployed to the public Testnet, and the Ethereum Foundation is running a 50-node strong cluster of Swarm nodes together with a public web gateway on https://swarm-gateways.net. We welcome everyone to try it out or commit to operate stable nodes. It has been a year and a half since the first release of the POC2 series was deployed and the Swarm project launched its public alpha network. Two Swarm summits, two orange papers and forty thousand lines of code later, it is time to take stock. In the past year the Swarm team has grown in size and is now on fire delivering the vision. We have been busy redesigning the network layer, rewriting the retrieval protocol using a stream abstraction, rewriting connectivity management and the overlay network code as well as developed a sophisticated network simulation framework to test algorithmic correctness, scalability and fault tolerance of various subsystems. POC3 code was finalised just in time for the Swarm Orange Summit in Ljubljana, where we had 80 participants and a very inspiring and creative week (watch this two-minute video hosted on Swarm) of talks and coding. It is inspiring to see a growing number of contributors and companies that want to build on swarm. Swarm content storage is a lot more than just “bittorrent on steroids”. The technical details can be found in the chapter on architecture in the new and improved Swarm guide. You’ll find a more thorough academic presentation of Swarm’s components in the orange papers or learn more about Swarm through the recorded conference talks. In an earlier blog post, we introduced the basics of Swarm storage and content distribution. At its core, Swarm is a service that provides APIs to upload and download content to the cloud and through URL-based addressing offers virtual hosting of websites and decentralised applications (dapps) without webservers, using decentralised peer-to-peer distributed infrastructure. The vision is that of a new internet which is not only fault-tolerant, has zero downtime and offers censorship resistance but is also economically self-sustaining due to a built-in incentive system. By compensating nodes for contributing their bandwidth and disk space, these incentives aim to achieve reliable low-latency scalable retrieval of popular content on the one hand and guarantees persistence of important yet rarely accessed data like archives or backups on the other. For smooth delivery Swarm will use the SWAP protocol (planned for POC3.1) while for storage guarantees it will use a two-tiered insurance system (planned for POC4). Beyond the basics of data storage and delivery, the POC 3 release includes some new and experimental features. The same p2p connections that are used for data storage and delivery can also be used for node-to-node messaging. PSS combines Swarm routing (bzz) with the Whisper (shh) encrypted message format (bzz+shh=pss). In short, PSS is a messaging protocol with strong privacy features running on top of the Swarm network. This messaging infrastructure can be the foundation of a whole new system of internode communication services (the email, tweet, newsletter of the future), hence, can be referred to as Postal Service over Swarm. PSS is fully featured yet experimental on the new POC3 network and dapps can interact with it using a JSON RPC API. We are collaborating closely with companies and projects that want to use pss to build second-layer infrastructure. Mainframe is building a slack-alternative collaborative group communications tool (Onyx) and their web3 SDK, and Status have expressed interest in building it into their mobile chat. Another experimental new feature in POC3 is the Swarm Mutable Resource. Typical in p2p storage systems, content is addressed by its digital fingerprint (hash) and any changes to the content results in a change of this address. Users of the web, however, are accustomed to mutable resources: when visiting URLs we expect to see the most up-to-date version of the ‘site’. In order to make it easy to access changing content at permanent human-readable addresses, Swarm integrates with the Ethereum Name Service (ENS) on the Ethereum blockchain. This is what allows us to reference Swarm content by names like bzz://theswarm.eth. Swarm POC3 adds another layer in the form of Mutable Resource Updates (MRU). These allow off-chain updates of content associated with an address at a potentially faster pace than ENS updates on the blockchain could support and without incurring the cost of on-chain transactions. MRU is an experimental feature in current POC3 testnet and is still undergoing changes. FUSE enables users to integrate Swarm data directly into their local file systems (only on Linux and Mac). Using this system, users can “mount a Swarm manifest” as if it were a regular directory. It supports file system read and write operations, in which all content is automatically synced with the Swarm. In future, combining FUSE with Swarm Mutable Resources, it should be possible, for example, to sync your entire home folder between devices - the backend to a decentralised storage with a Dropbox-like functionality. Swarm 0.3 comes with built-in encryption allowing for secure uploads of private data. The way encryption works users can upload a directory privately and still ‘share’ a subdirectory with specific peers. Access Control Trees (Swarm 0.3.2) will offer an API for users to manage access to content independently of publishing it. Granted access will work across versions of resources. The year ahead will be both exciting and challenging. As part of the POC3 series we are planning to switch on a revamped SWAP accounting system (Swarm 0.3.1) and enable ‘light’ Swarm nodes (Swarm 0.3.2). Implementing erasure coding, proof of custody, insurance are also on the roadmap. We are on target delivering Swarm POC4 (production beta prerelease) in 2019. We keep on building a community with our allies who champion the values of web3 and actively collaborate through working groups, building the foundational infrastructure, the backbone of second-layer services such as databases (http://wolk.com), private data management (http://datafund.io), rights and creative works licensing (http://jaak.io), decentralised version control (ethergit, http://epiclabs.io), video transcoding and streaming service (http://livepeer.org), communication and collaboration (https://mainframe.com) and the list is growing. We welcome your feedback and contribution. Come find us in our gitter channelgithub repository. The Mist team has been working hard on a solution to balance decentralization with user experience. While running a full node is important to the health of the network, we all know the weight of doing so on a consumer machine. Amazing services, like Infura, can help you get connected immediately but introduces new risks. From the beginning, Ethereum Wallet and Mist beta have prioritized running a local ethereum node, helping relay blocks and keep the pulse of the ethereum blockchain worldwide. Today, we are introducing a hybrid solution that brings the swiftness of Infura with the power and security of running your own Geth node. 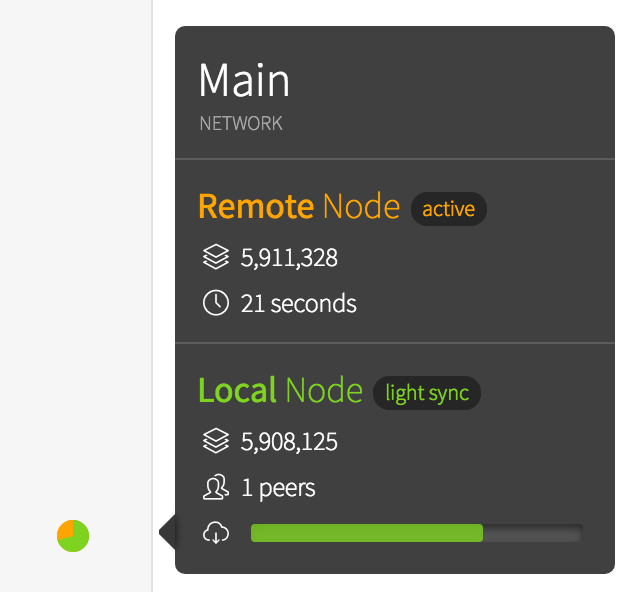 After connecting immediately to a remote node, your local node takes over all subscriptions and filters once it's up to date. Přátelé. Just a quick update today! Applications for sponsorships, scholarships, student discounts and builder discounts will be up until 11:59PM PST on July 24th. After that, there will no longer be a way to submit an application for these tracks. Please note that if you’ve already submitted an application or do so before the deadline, it will be processed and responded to by the Devcon team in short order! As we continue to work toward providing everyone an opportunity to attend Devcon, we’re capping applications in preparation for future waves and to give the general public the chance to join us! We look forward to receiving your applications soon, and to seeing you in Prague! We've identified an interface bug on Windows versions of Mist Browser and Ethereum Wallet v0.11.0 releases, leading to a blank screen after startup. This release fixes it. Visit https://devcon4.ethereum.org/c... to learn more and apply! 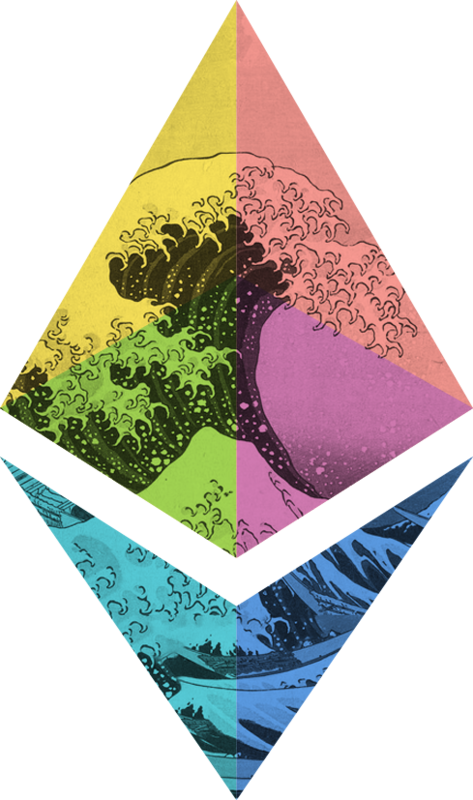 We’ve been hard at work getting to know so many amazing people and projects, and are extremely excited to announce the recipients of the Wave 3 of the Ethereum Foundation Grants Program! We kicked off 2018 with a blog post to galvanize scalability research for first and second-layer solutions. Since then, we’ve committed over $11M to 52 projects dedicated to advancing the Ethereum ecosystem. Grants have funded multiple plasma and state channel implementations, diverse client research, enhanced developer frameworks, security audits, and so much more (find them all in the previous posts: Wave 1 & Wave 2)! The EF Grant Program provided more than $11M in support to 52 projects since early 2018 (Waves 1, 2, and 3). Our funding allocation remains true to the program’s original purpose, awarding nearly $7M to scalability projects. After this, security has been granted almost $2M, #buidl projects (projects that improve user experience) received $1.6M, and DevEx projects (projects that improve developer experience) received $744K. While dollar allocation remains heavily focused on scalability, the number of projects funded are more evenly distributed between categories. The EF Grants program is constantly evolving. With this round, we’ve refined our internal processes to ensure timely fund disbursement. We understand how quickly the space moves and believe in the importance of expedient fund dispersal to the front line. Eventually, we aim to award grants on a rolling basis in order to provide more immediate support to the projects and teams leading the charge for decentralization and transparency. Ideal applicants come with strong technical knowledge, project roadmap, and show a commitment to fostering collaboration within the ecosystem. For more information about applicant expectations and process workflow, please see our Applicant Expectations and FAQs. With each round, the grants program evolves. Our goal is to effectively grease the wheels for projects building the critical infrastructure of our young community. There are many tracks to lay down before Ethereum “makes it” and it’s been incredible to see all the projects working to lay down these tracks. The applicant pool for Wave 3 offered a record number of strong teams and innovative ideas. It’s fascinating and humbling to see the diversity of projects from around the world with a shared interest in fostering the development of Ethereum. These are folks spending their free time reading ethresear.ch, developing new libraries and wallet designs, and engaging in communities discussing the latest in DApp usability and security…and we love them for that. Scalability will continue to be a focus of EF grants, but we also look to fund other critical work. This includes better UX, new clients, high-level languages, better developer tools, and efforts to make Ethereum applications more secure. With Wave 3, we expanded into education and community efforts in order to help bring new talent into the ecosystem. Want to #BUIDL with us? See the dev wishlist below and follow links to learn more. If you can imagine a project relating to the topics listed, submit an application and talk to us! Read the original DevGrant post. Read the post that kicked off the current program. Find the grantees from Wave 1 and Wave 2. Keep up to date with research here and here. With the growing number of applicants, we’ll be needing to create an official website for the Grants Program. Do you have any ideas on how to make the website fun, transparent, and useful to future grant applicants? (mmhmm) Great! Because we will be running a contest and crowdsourcing ideas from all of you. Selected ideas will receive some unicorn love and some ETH. Stay tuned for details on how to participate! The latest version 0.4.25 release of Solidity fixes two important bugs. Another important bug has already been fixed in version 0.4.22 but it was only discovered recently that the bug existed. Note that the Ethereum Foundation runs a bounty program for the code generator part of Solidity. Summary: Using short types in the exponent of an exponentiation operation can lead to invalid results. The Solidity language allows integer types that are shorter than 256 bits, even though the Ethereum Virtual Machine only knows types of exactly 256 bits. Because of that, higher order bits need to be set to zero from time to time. For many operations, it is not relevant whether those bits are set to zero or not (addition is one example). Because of that, the Solidity compiler delays this cleanup until it is needed in order to save gas. In the very special circumstance that the exponent of the ** operator has a type that is shorter than 256 bits, but not shorter than the type of the base and contains dirty higher order bits, this can lead to an incorrect result. Note that literal exponents like in x ** 2 as well as the case where the type of the base is uint256 or int256 are unaffected. Note that a function parameter can have dirty higher order bits if called by a malicious entity, and the same is true for data returned from functions of contracts deployed by malicious entities. After having screened a large number of contracts, we deem this bug to affect only a very tiny number of smart contracts, if any at all, because the regular uses of the exponentiation operator do not lead to the bug. This bug was found by nweller. Summary: Calling functions of other contracts that return multi-dimensional fixed-size arrays results in memory corruption. If Solidity code calls a function that returns a multi-dimensional fixed-size array, the returned ABI-encoded data has to be converted to Solidity’s internal representation of arrays. In Solidity, multi-dimensional arrays are implemented as arrays of memory pointers, while in the ABI, the data is encoded inline. The decoder did not take this difference into account with the result that the returned elements are interpreted as memory pointers and thus can cause memory corruption if the return values are accessed. Calling functions with multi-dimensional fixed-size array arguments is unaffected as is returning fixed-size arrays from function calls if they are not used in a Solidity contract. The bug is only in the component that decodes a multi-dimensional fixed-size array that is returned from a function call from Solidity. This bug was found by jmahhh. Summary: Structs as event parameters are not handled properly. Structs were not meant to be supported as event parameters without the new ABI encoder. The compiler did accept them nevertheless, but encoded their memory address instead of their actual value. Even with the new ABI encoder, structs cannot be indexed event parameters. Now, structs are properly disallowed for the old encoder and if they are indexed also for the new encoder. Greetings from the Ethereum Foundation Grants Team! As we go full steam ahead to Devcon 4, we’re back to announce Wave 4 of the Grants Program! Thank you to all the fantastic community members that have applied with creative ideas on how to bolster our ecosystem. We would not exist without the time and energy that you put into Ethereum. While the program continues to grow, we will increasingly continue to involve more community members in the decision making process. The Grants Program today is vastly improved from just earlier this year, thanks to all the helpful feedback from the community, allowing us to provide better public tools and infrastructure. If you haven’t heard of us before, our last announcement went into some depth on program history, funding summary, and processes. Find that post here, and you can see guidelines and more here. Prototypal – $375K. Front-end state channel research and development. Finality Labs – $250K. Development of Forward-Time Locked Contracts (FTLC). Kyokan – $125K. Development of production ready mainnet Plasma Cash & Debit plugins. Atomic Cross-Chain Transactions – $65K. Research led by Maurice Herlihy of Brown University. EthSnarks – $40K. Development of a cross-compatible SDK for zkSNARKS to be viable on Ethereum. Flintstones – $120K. Further development of the Flint Language including a security focused IDE by Susan Eisenbach of Imperial College London. TrueBlocks – $120K. Open source block explorer. Gitcoin – $100K. Funding bounties on Gitcoin. VulcanizeDB – $75K. “Community sourced” block explorer. Buidler – $50K. Development of modular alternative to Truffle based on Ethers.js. Ethdoc – $25K. Open source tool for organization and interaction of smart contract codebases. Ethers.js – $25K. Support for ricmoo to continue development and maintenance of Ethers.js. Kauri – $25K. Funding documentation bounties on Kauri. Magic Money Tree (Dark Crystal) – $50K. Tool for securely storing and recovering keys and secrets through a multisig design by the Secure Scuttlebutt Team. Elizabeth Binks – $10K. Ring signature implementation with nine or more keys. Lindsey Gray – $10K. Development of C++ BLS-381 implementation. Sigma Prime – $150K. Lighthouse Eth 2.0 client in Rust. 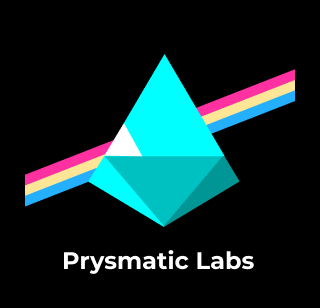 Prysmatic Labs – $500K. Eth 2.0 Prysm client. Status – $500K. Eth 2.0 client in Nim. Find the grantees from Wave I, Wave II, and Wave III. This release improves the usability of interfaces, fixes some bugs, extends the SMT checker and provides an early preview of the Yul optimizer. If you want to perform a source build, please only use solidity_0.5.1.tar.gz and not the zip provided by github directly. Allow mapping type for parameters and return variables of public and external library functions. Allow public functions to override external functions. Code generator: Do not perform redundant double cleanup on unsigned integers when loading from calldata. Commandline interface: Experimental --optimize option for assembly mode (--strict-assembly and --yul). SMTChecker: SMTLib2 queries and responses passed via standard JSON compiler interface. SMTChecker: Support msg, tx and block member variables. SMTChecker: Support gasleft() and blockhash() functions. SMTChecker: Support internal bound function calls. Yul: Support Yul objects in --assemble, --strict-assembly and --yul commandline options. Assembly output: Do not mix in/out jump annotations with arguments. Commandline interface: Fix crash when using --ast on empty runtime code. Code Generator: Annotate jump from calldata decoder to function as "jump in". Code Generator: Fix internal error related to state variables of function type access via base contract name. Optimizer: Fix nondeterminism bug related to the boost version and constants representation. The bug only resulted in less optimal but still correct code because the generated routine is always verified to be correct. Type Checker: Properly detect different return types when overriding an external interface function with a public contract function. Type Checker: Disallow struct return types for getters of public state variables unless the new ABI encoder is active. Type Checker: Fix internal compiler error when a field of a struct used as a parameter in a function type has a non-existent type. Type Checker: Disallow functions sha3 and suicide also without a function call. Type Checker: Fix internal compiler error with super when base contract function is not implemented. Type Checker: Fixed internal error when trying to create abstract contract in some cases. Type Checker: Fixed internal error related to double declaration of events. Type Checker: Disallow inline arrays of mapping type. Type Checker: Consider abstract function to be implemented by public state variable. CMake: LLL is not built anymore by default. Must configure it with CMake as -DLLL=ON. Docker: Includes both Scratch and Alpine images. Emscripten: Upgrade to Emscripten SDK 1.37.21 and boost 1.67. Fix handling of standard-json in the commandline executable. Remove support of nodejs 4. [Eth 2] Vitalik: layer 2 computing model using optimistic state rootsELI5 version. Big if it works. 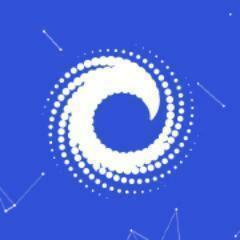 ConsenSys reorg from 1.0 to 2.013% layoffs. Latest core devs callnotes. Fork will be around Jan 16th. Working group updates. Dropping Ropsten/PoW testnets forever? 0x Instantideas to explore with 0x. One of my best friends launched StoopAndroid/iOS newsletter reader. It uses a dedicated email and clean design experience to keep your information diet healthy. If you subscribe to newsletters, you will like it. For reasons unknown, Twitter has locked my @evan_van_nessMailchimp arbitrarily banned me earlier this year, it’s sad to see web2.0 platforms making the case for their own demise. Web3 can’t come fast enough. Constantinople is the name given to this network upgrade. Previous network upgrades have been given other names such as Spurious Dragon and Byzantium. As an Ethereum user or ether holder is there anything I need to do? If you use an exchange (such as Coinbase, Kraken, or Binance), a web wallet service (such as Metamask, MyCrypto, or MyEtherWallet), a mobile wallet service (such as Coinbase Wallet, Status.im, or Trust Wallet), or a hardware wallet (such as Ledger, Trezor, or KeepKey) you do not need to do anything unless you are informed to take additional steps by your exchange or wallet service. As a node operator or miner, what do I need to do? What happens if I am a miner or node operator and I do not participate in the upgrade? If you are using an Ethereum client that is not updated to the latest version (listed above), your client will sync to the pre-fork blockchain once the upgrade occurs. You will be stuck on an incompatible chain following the old rules and you will be unable to send ether or operate on the post-upgrade Ethereum network. What is a network upgrade in Ethereum-land? A network upgrade is a change to the underlying Ethereum protocol, creating new rules to improve the system. The decentralized nature of blockchain systems makes a network upgrade more difficult. Network upgrades in a blockchain require cooperation and communication with the community, as well as with the developers of the various Ethereum clients in order for the transition to go smoothly. What happens during a network upgrade? After the community comes to an agreement concerning which changes should be included in the upgrade, changes to the protocol are written into the various Ethereum clients, such as geth, Parity, and Harmony. The protocol changes are activated at a specific block number. Any nodes that have not been upgraded to the new ruleset will be abandoned on the old chain where the previous rules continue to exist. What changes are going into Constantinople? Changes that are implemented in Constantinople are defined using EIPs. Ethereum Improvement Proposals (EIPs) describe standards for the Ethereum platform, including core protocol specifications, client APIs, and contract standards. The following EIPs will be implemented in Constantinople. In short: This EIP adds native functionality to protocol so that it is cheaper & easier to do certain things on chain. Adds a new opcode at 0xf5, which takes 4 stack arguments: endowment, memory_start, memory_length, salt. Behaves identically to CREATE, except using keccak256( 0xff ++ sender_address ++ salt ++ keccak256(init_code)))[12:] instead of keccak256(RLP(sender_address, nonce))[12:] as the address where the contract is initialized at. Important for state-channel use cases that involve counterfactual interactions with contracts. In short: This EIP makes it so you can interact with addresses that have yet to be created. This EIP specifies a new opcode, which returns the keccak256 hash of a contract’s code. Many contracts need to perform checks on a contract’s bytecode, but do not necessarily need the bytecode itself. For instance, a contract may want to check if another contract’s bytecode is one of a set of permitted implementations, or it may perform analyses on code and whitelist any contract with matching bytecode if the analysis passes. Contracts can presently do this using the EXTCODECOPY opcode, but this is expensive, especially for large contracts, in cases where only the hash is required. As a result, a new opcode is being implemented called EXTCODEHASH which returns the keccak256 hash of a contract’s bytecode. In short: This EIP makes it cheaper (less gas is needed) to do certain things on chain. This EIP proposes net gas metering changes for SSTORE opcode, enabling new usages for contract storage, and reducing excessive gas costs where it doesn’t match how most implementation works. In short: This EIP makes it cheaper (less gas is needed) to do certain things on chain, especially things that are currently “excessively” expensive. The average block times are increasing due to the difficulty bomb (also known as the “ice age”) slowly accelerating. This EIP proposes to delay the difficulty bomb for approximately 12 months and to reduce the block rewards to adjust for the ice age delay. In short: This EIP make sure we don’t freeze the blockchain before proof of stake is ready & implemented. 1. More people started using Ethereum, for more things — but we’re still far from mass adoption. 2. Decentralized Finance (DeFi) and stablecoins — a new class of applications that saw many product launches and some breakout successes. 3. The year of #BUIDL — it became radically easier to build applications on Ethereum. Our development and security tooling improved significantly, we got better at sharing best practices, and hackathons became a trend. 4. Layer 2 scaling — multiple “layer 2” applications launched, and we made critical progress towards making these scaling solutions easy to use for developers. 6. ETH 2.0 / Serenity — the roadmap solidified, and it moved from a research project to an engineering effort. Many more applications launched in 2018, including many in the “decentralized finance” category (see next section). Many others were games like Gods Unchained (beta, November 2018), or gambling services like FunFair (mainnet, September 2018). There are hundreds of other applications that use the Ethereum blockchain, which you can find listed here or here. Overall, consumer use of applications on Ethereum remains low. When we use measurements like daily active users who interact with a dapp’s smart-contract on the blockchain, we see an average of between 10,000–15,000 users on any given day in 2018. This year saw an expansion of the type of DEXs built on Ethereum. Kyber, which launched in March 2018, does away with the order book and simply lets users receive a quote, and instantly swap one asset for another. Airswap, which launched in April 2018, similarly provides a simple “token swap” service. Uniswap, which implements a novel automated market-making feature inspired by a reddit post from a few years back, launched in November 2018. It operates entirely on-chain, and makes markets itself using a deterministic algorithm. Gnosis’ DutchX protocol went live on mainnet in October 2018, with a user-interface to the protocol called slow.trade that went live in December. StarkWare started working on zero-knowledge technology that will help scale DEXs and is expecting to launch on testnet in Q1 2019. One notable trend is that we saw alternatives and competitors to popular tools start to emerge. In 2018 ethers.js saw wider adoption as a web3.js alternative, blockscout launched as an open-source alternative to etherscan, the new Goerli testnet launched, and several Truffle competitors emerged like embark, etherlime (based on ethers.js), and buidler. 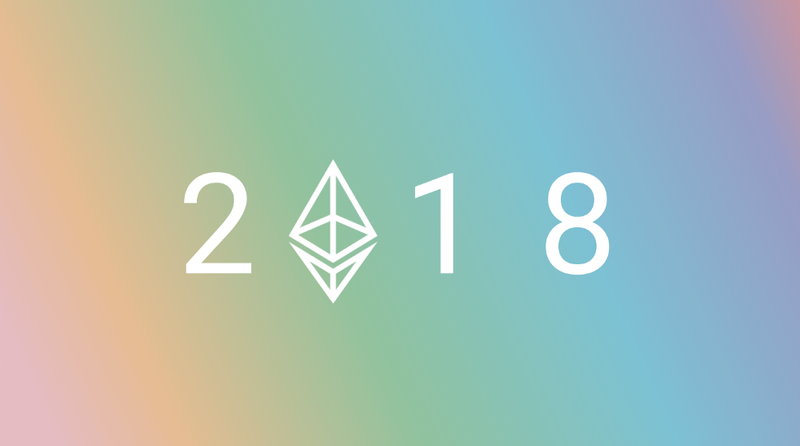 In 2018, the Ethereum security community improved. New security tools became available that made it easier to build secure applications. Trail of Bits released several tools in March 2018 (who also maintain a useful list of resources here), including static analysis tools, fuzzing tools, and more. Securify, an automated security scanner for Ethereum smart contracts, was released in July 2018. Mythril, a security analysis tool initially released in 2017, became a platform and re-branded to MythX. In October 2017 ETHWaterloo set a record as the largest Ethereum hackathon ever, which was quickly beaten by ETHDenver in February 2018. Over the rest of the year, there were 6 more ETHGlobal hackathons that served more than 5,800 developers, as well as other events like ETHMemphis and two hackathons held by Status. In 2018 it was finally practical to run an Ethereum hackathon — there were enough developers who wanted to learn how to build on this tech, the ecosystem was varied enough that they had many interesting projects to work on, and the tools were mature enough that it was actually feasible to build a working demo in 36 hours. Many of the individual projects mentioned above — including the Goerli testnet, Set protocol, Denode, and Cryptokitties were conceived or launched at ETHGlobal events. Spankchain (micropayments through payment channels) launched their beta in April, and have been live in production ever since. Funfair (casino games running in state channels) launched to mainnet in September. Connext (payment channel hubs for micropayments) launched their first non-custodial hub on mainnet in September in collaboration with Spankchain. Celer Network (a state channel network & liquidity solution) launched their testnet & demo apps in October. Raiden, the long-anticipated ERC20 payment channel network, launched their alpha release running live on mainnet in December. The number of live projects using channels will only increase as the technology becomes easier for developers to use. Counterfactual (a framework that makes it easier to build a channelized application) published their work on generalized state channels in June, open-sourced all their code in November, and is launching a full demo environment in January 2019. Magmo, a framework for a specific subset of channelizable applications (“force move games”) using state channels, released a demo application at DevconIV. This broad exploration of a large design space has been productive for researchers, but practical implementations are still mostly theoretical or in early stages. One exception is the Plasma Cash implementation built by Loom, released in June 2018. Thanks to Georgios Konstantopoulos, Jeff Coleman, Spencer Noon, Alex Wade, Xuanji Li, Danny Ryan, Heather Davidson, Gregor Zavcer, Mike McDonald, Corey Petty, Ameen Soleimani, Jens Frid, and others who took time to answer questions and contribute to the creation of this article. After some amount of time has passed (defined as ENTRY_EXIT_DELAY ~= 25.6 minutes), a validator is active in the ETH 2.0 system and will be assigned slots to act as a proposer or attestor. Deposit root, the most recent root found in the ETH 1.x deposit contract. When selected to attest to beacon blocks, the validator should wait until halfway through their assigned slot to construct their attestation. The validator will construct the attestation with the above data with their signature, custody bitfield (in phase 1), and the participation bitfield. So far the current specification outlines the responsibilities for validator assignment on the beacon chain. Assignments on shard chains will differ and their definitions solidify in future phases. The code above can trigger deposits happening at certain slots and checking the size of the validator set increased. We can also check if applying valid penalties at certain slots penalized certain validators. We believe this format will be increasingly useful as the beacon chain evolves and more complex scenarios can be modeled. As we integrate epoch processing tests soon, we will be able to test for Casper FFG finality and more granular Proof of Stake details. We recently finished integrating the entire epoch processing pipeline as defined in the specification into our state transition function. 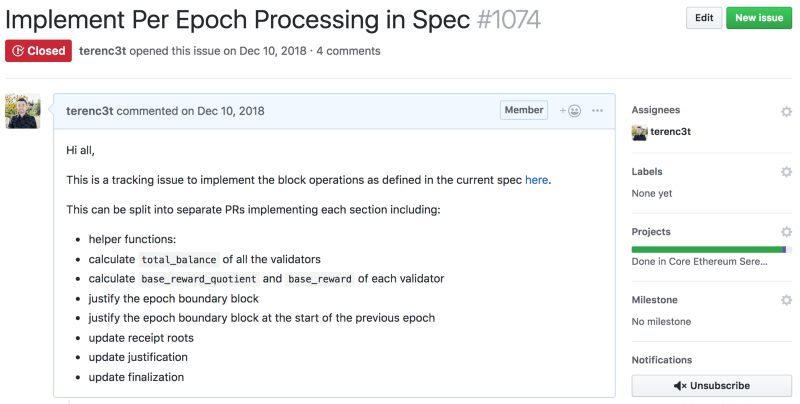 This marks a milestone of completely wrapping up the state transition function for Ethereum Serenity Phase 0 within the Prysm repo. The epoch processing consists of processing various beacon state and validator structure fields. After the last slot of the epoch, the beacon node will proceed to update validator balances, justify and finalize checkpoints, and cross linking shard checkpoints back to beacon chain. The reason we don’t want to process those fields for every slot because they are computational intensive hence we only want to do it once at the end of the epoch. The validator deposit contract is the main bridge between the ETH 1.0 PoW chain and the beacon-chain. Future validators will deposit 32 ETH into the deposit contract and the beacon node will listen to Deposit Contract for the logs emitted. Using these emitted logs we can ascertain which validator has deposited on the POW chain then add them to the validator registry on the beacon-chain. Block proposal mechanism by the validator client also requires validator client to be aware of the most recent receipt root in the deposit contract, which would mean that this cached deposit trie would have to be constantly updated till the time comes for a validator to propose. This has been implemented in this PR. Validator deposits for Ethereum Serenity will happen through a smart contract on the PoW chain. Users who currently hold Ether and wish to become validators will deposit Ether into the contract, and the deposit data will be kept within a Merkle trie in the contract’s state for easy generation of Merkle proofs and verification once such validator runs a beacon node. Although the contract contains useful utilities to fetch Merkle branches on the fly, we also believe it will be useful for nodes to keep track of a cached local trie to participate in the voting period of deposit roots. 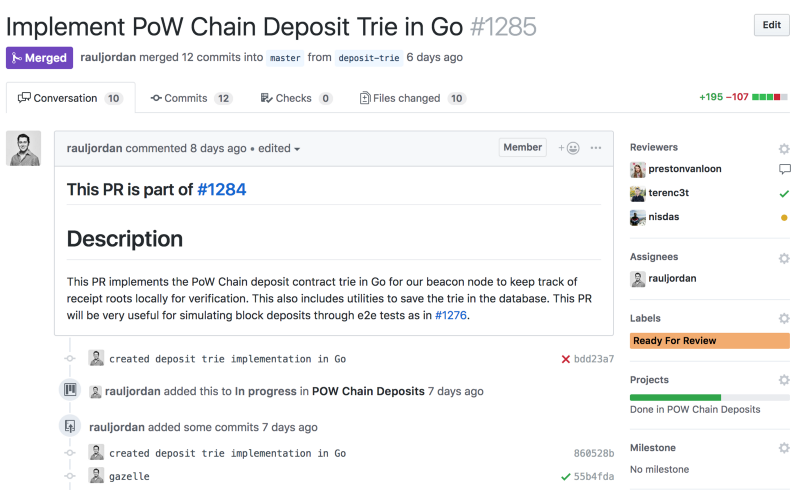 We have implemented a simple Merkle trie in Go that matches the tracking deposits in the PoW deposit contract. This trie can be stored in persistent storage in the Prysm node and can be used by other runtime services in Prysm for deposit verification. See more in the PR here. The fork-choice rule for Ethereum Serenity is officially called Latest Message Driven, GHOST (Greediest Heaviest Observed Sub-Tree). It is based on combining details of Proof of Stake finality and justification into selecting the next fork in the chain. At its core, it is a block-vote weighted function that relies on the “latest” attestation messages seen by the active validator registry, treating those latest messages as votes to cast decisions on a potential beacon chain head. Naive GHOST is known to be quite slow, as it performs many nested looping operations to determine the correct head. Our most naive implementation runs at around 800ms for 100,000 active validators in the state to select the next beacon block head. There is, however, a whole suite of LMD GHOST optimizations that we believe can improve its efficiency more than 10x, including the way we store votes for blocks, how we compute ancestor blocks for vote checking, and how we iterate to determine the best child. Our aim is to reach 25–50ms for GHOST with 100,000 active validators through the next few PRs, with some ideas already implemented by Vitalik in the Ethereum Research repository here. Currently, we allow users to run a local demo of Prysm which simulates a real runtime by having an initial validator set and a simulator of beacon blocks being published to the beacon node. The problem with this demo is it is not quite realistic, as it does not truly model validator behavior. It also does not model how the chain or node will evolve at scale and only serves the purpose of being a visualization for a basic runtime with validator shuffling. This will give us high confidence our runtime is effective, especially if we leverage the real function used by the runtime itself. Our Validator Deposit Contract was written in Solidity whereas the official contract in the spec is written in Vyper. We made the decision to follow the spec as close as possible so as to deprecate the solidity contract for one written in Vyper. This came about as testing on Deposit and ChainStart logs gave different results from what we were expecting due to minor changes between our contract and the Vyper contract. The expectation of a full validator node is to track latest attestation vote from each validator. If that node was only listening for blocks, then that would be their sole source of this information. The expectation of a validator is to run a node that is listening for attestations on the wire as well as those from blocks. The default behavior of a full node should be to support listening to attestations on the wire and reacting to this information, if it’s not supported then it can not be used by a validator. Receiving a block is a trigger for fork choice calculations so is receiving new attestations outside of a block. In design, the beacon node needs an attestation pool to track each validator’s attestation and use those data to apply fork choice. We started off with a mapping of public key to attestation data and found deficiency where we could just use mapping of participation bitfield to attestation data. The later mapping avoids duplication because in an optimal case, most validators in a committee should point to the same attestation data. As much of the beacon chain specification as settled down, we can return to work on the Prysm validator client. We had deferred work in this area while we update the beacon chain node to match much of the fast-moving changes and, as a result, the validator client has decayed slightly. We also think our implementation can be less fragmented into a simple routine: validator waits for assignment slot, then performs the role. It is critical for a validator client to keep safe control of a variety of secrets, including a RANDAO reveal, a BLS private key, and information about proof of custody of shard data. We are doing more work on structuring the responsibilities of our validator client and how a validator should interact with wallets to prevent unnecessary data leak to the world. Given the document created by Danny here, there is more work getting done to further clarify what a validator client should be responsible for. We just finished the ETH2.0 implementers call, it was one productive call filled with lots of great discussions on the latest researches and implementers updates. Take a listen if you haven’t yet! Agenda and Recording. This week, James Prestwich published a fantastic post explaining the Ethereum 2.0 roadmap objectively along with its challenges and current progress. We highly encourage anyone following the project to read through the document, as it serves as a useful reference at an introductory to intermediate technical level of understanding. This release adds support for calldata structs and packed encoding with ABIEncoderV2. We also introduced some changes to the C API and added support for continuous fuzzing via Google oss-fuzz. In addition to that, we added a new commandline option for improved (colorized) diagnostics formatting. Allow calldata structs without dynamically encoded members with ABIEncoderV2. C API (libsolc / raw soljson.js): Introduce solidity_free method which releases all internal buffers to save memory. Commandline Interface: Adds new option --new-reporter for improved diagnostics formatting along with --color and --no-color for colorized output to be forced (or explicitly disabled). Code Generator: Defensively pad allocation of creationCode and runtimeCode to multiples of 32 bytes. Commandline Interface: Allow yul optimizer only for strict assembly. Parser: Disallow empty import statements. Type Checker: Disallow mappings with data locations other than storage. Type Checker: Fix internal error when a struct array index does not fit into a uint256. Type System: Properly report packed encoded size for arrays and structs (mostly unused until now). SMT: If using Z3, require version 4.6.0 or newer. Soltest: Add parser that is used in the file-based unit test environment. This is the second of weekly Friday releases in February -- Let There Be Liquidity. This release includes a number of small feature additions/modifications, clarifications, and minor bug fixes. The most significant features added were (1) enforced ordering of eth1 deposits (to avoid replay attacks) and (2) enabling transfers from "withdrawable" validator accounts (to open up liquidity options for validators before phase 2). The core of the phase 1 spec is currently being built, but the exact particulars should be considered unstable and not yet targeted for production development. Outside of this immediate release, progress continues to be made on the cross-client testing, and much progress have been made around network specifications (#593) and discovery protocol.